It was recognized that in order to achieve a bustling, vibrant City Centre, we would require a consistent vision and support to be successful. In September 2017, a consultant was chosen to develop a City Centre Area Redevelopment Plan (ARP) which, is a key component to our revitalization initiative. Development of the ARP was subsequently approved by City Council as part of the 2017-18 Corporate Plan. The ARP is intended to provide a conceptual framework and masterplan for the revitalization and redevelopment of the City Centre. This plan is a roadmap for future growth. The City Centre ARP will include a plan that outlines the physical design, uses and programming for the City Centre area, as well as policies and implementation actions that will help the City, developers, businesses and residents grow the City Centre into a vibrant place. Over the past year, there have been a number of opportunities for engagement and community input though various discussions, presentations, design charrettes, “café chats” and one-on-one meetings. The input collected at these various public engagement sessions provided an interactive process and valuable ideas on what residents would like to see in our City Centre. 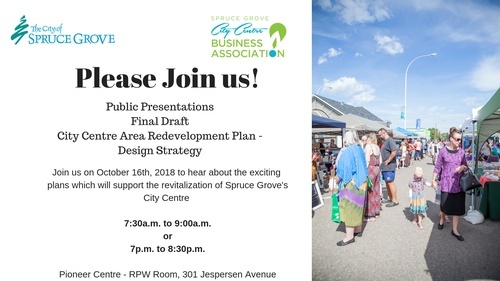 The City of Spruce Grove along with the City Centre Business Association (CCBA) are very pleased to present the Draft City Centre Area Redevelopment Plan at one of two public sessions on Tuesday, October 16th, 2018 at the Pioneer Centre. We look forward to revealing the exciting and vibrant plan for our City Centre.